Planning a wedding on a budget requires creativity to ensure that you save money as much as possible, while still achieving a beautiful wedding. One area for potential savings is with your invitations. Professionally printed invitations can cost you at least $3 each plus postage, but you can make your own DIY wedding invitations for a fraction of the cost! Start by looking at pictures of wedding invitations online for inspiration. When I did this, I found that one of my favorite styles was layering, with multiple colored papers stacked and glued together. This style of invitation can be costly to purchase, usually at prices of $3 per invitation or more. However, this look is simple to create on a tight budget if you're willing to DIY. Craft stores and other retail outlets should have a variety of specialized cardstock that will suit your needs. Try shopping online for your papers, you can find really great deals and online coupons that might not be available in store. Purchase colored card stock in the color you want for the back of your invitation and cut it to a size that fits in the envelopes you want to use for the invitations. A good paper cutter can really help if you're planning to make DIY wedding invitations. If you don't have one, you can usually find them available for use at copy shops. Additionally, you could consider purchasing one at your local craft store– just don't forget your coupon! If you need to order it, be sure to check shipping quotes so that your overall cost still fits into your budget. Format the text of your invitation to fit on a page ½-1″ smaller than your large pieces of card stock. (For example, your cardstock pieces might be 5″ x 7″ and your smaller paper might be 4″ x 6″.) Once you have the layout completed, print a test invitation and cut it down to size. You'll want to get the idea of exactly how the finished product will look. You can easily print your DIY wedding invitations at home using a basic inkjet or laser printer. Just make sure you have plenty of ink! Many couples include RSVP cards in their invitations, but this is an added cost because of the cards and envelopes, especially if you pre-stamp the envelopes. One alternative is setting up a free wedding website where guests can RSVP online. Just say “RSVP at www.weddingwebsite.com” on your reception card. Alternately, give an RSVP phone number or email address. If your wedding and reception are taking place at different locations, you may need to create a reception card as well. This card is usually about half the size of your invitation and is printed on coordinating paper. It should include information such as where the reception is taking place. If there is room, you can also include hotel information or a wedding website on the reception card. The last step is to create an assembly line to put together your invitations. A piece of double-sided tape across the top of your page with text is the easiest way to hold it to the colored card stock. Another idea is to punch two holes through both layers of the invitation, near the top, thread a piece of ribbon through and tie it in a bow on the front. Stuff your envelopes, stamp and address them, and you are ready to go! If you aren't hand-addressing your invitations, you could consider printing the addresses onto your envelopes. You will need to start by making a spreadsheet of your guest list addresses. Then you can use Microsoft Word or InDesign to do a mail merge to export your guest addresses into single file format. Then, you can print your addresses onto your envelopes, or onto sticker labels to adhere to your envelopes. One final consideration before digging in on your project is the cost of mailing your invitations. Before finalizing the paper, envelopes, and contents of your homemade invitations, take a completed test invitation to the post office to see how much it will cost to mail. If your invitation weighs more than one ounce, you will have to pay an extra 20 cents in postage to mail each one. While 66 cents in postage doesn't seem like a lot, it can quickly add up, particularly if you're planning a big wedding. I'm going to walk you through the process of how I created my 3-Layer DIY Wedding Invitations myself, using my graphic design software and printing at home, as well as all of the costs involved in doing so. The invites are 3 layers in different shades: Seaglass, Opal, and Ice Blue. The paper I purchased will yield the 3 pieces for each invite, plus a response card and map card to also go inside the envelopes. The Ice Blue layer is the only printed layer of the invite itself. I used the custom print size settings to print the design onto the top layer of the invitation before assembling the layers. I created cutting templates so that I could take the papers to Kinko's to get the papers cut. They charge $1 per cut. Their industrial paper cutter can do exact measurements and cut 100s of sheets at a time. It cost me $16 plus tax to get the paper cut. It was so worth it- imagine cutting 100s of pieces of paper and trying to do it accurately! Save yourself the headache and take your paper to Kinko's! I cannot stress this enough. PRO TIP: Be sure to print your designs on your paper BEFORE trimming/cutting. I didn't do this, and feeding the pre-cut papers through my printer was an absolute NIGHTMARE. Take it from me… you don't want to do that. I highly suggest printing the designs (multiple on a page) first and then having them cut or cutting them yourself. Save yourself the agony. Trust me. I assembled the invitations with a tape runner I purchased at Walmart. You can see the assembly process below. I just centered the layers using my best judgment and attached them with the tape runner. .27 + .11 + .18 + .11 + .19= .86 PER INVITE for the paper. As far as printing, I printed them myself on my home printer . COST= FREE! (See some DIY printing tips here.) My printer kept telling me the ink was low, but I was able to finish the job. I printed 100s of sheets with no quality loss, so thankfully I didn't have to replace the original cartridges. Instead of messy glue sticks, I used this amazing product: the Scotch Tape Runner. I purchased it in the crafting section at Walmart, but you can also order it on Amazon. I got one of these and 2 refills. They cost around $5-7 for the dispenser, but the refills are a little less. These little runners were so easy to use and work great, so I cannot recommend them enough. $16 for cutting + around $15 for the tape runners= $31. Divided by 125 invites= an added .25 per invite. So… add that to the .86 and that's about $1.11 total, with assembly costs. That's it, folks!!! And they are under the weight limit you won't have to pay extra postage! 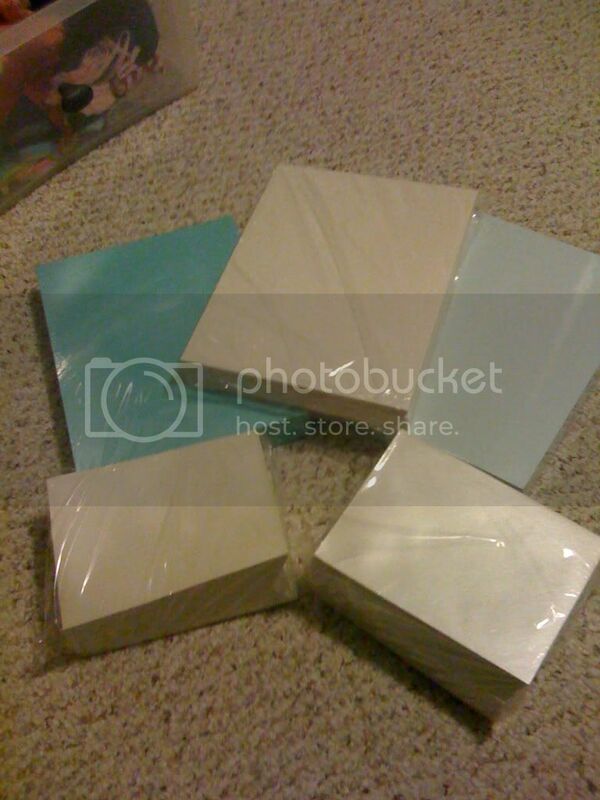 Plus, I still had tons of the paper left over to use on other crafts like Menu Cards, Signage for the wedding, etc. I was so thrilled with my savvy accomplishments… I can't even tell you. Where did you find the design for your invitation? I scanned in the swirly ornament from a stamp I had and then repeated it to make the pattern. If you aren't a professional designer, there are plenty of great Printable Wedding Invitations from our friends at Download & Print. I also created several Free Printable Wedding Invitations for you to use! Do you use a certain program on your computer? I laid out the invite in Adobe InDesign, which is a professional design software. You can get a free 30-day trial here, or sign up for a subscription. I have no idea how to create an invitation template. Where should I start? I started knowing that I wanted a layered invitation. I created boxes in InDesign at 3 different sizes in my colors to make the 3 layers, then I centered them to see how it would look once printed. How did you come up with the cut guidelines? To make the cutting templates, I just created a box the size of the layer I needed cut. So for instance, the backing layer was 5×7. I created a new file and placed as many 5×7 boxes that could fit on a standard sheet of paper. That number ended up being two for the 5×7 size. For the smaller pieces like the RSVP, I was able to fit up to four per page. What font did you use for your invites? The font for the monogram is Delouisville, which I found a free download for on Dafont.com, a great site for free fonts. The other two fonts are MrsEaves and Bickham Script Pro. If you're looking for premium wedding fonts that are inexpensive, you could browse Creative Market! You don't need a fancy professional printer, I just used a basic home inkjet printer. My current favorite is the Canon MG 7720 . Depending on the type or finish of the paper you use, you may be better off using a laser printer. Do you have some kind of secret to share about how you stacked the layers so evenly? I wish I could tell you some magical trick, but honestly, I eyeballed it. One key factor was the precise cuts by Kinko's. Those perfectly squared cuts made it much easier. If you're worried about this aspect, I definitely suggest getting your paper cut professionally. Did your printer enable you to print right to the edge of your top layer? Thankfully, I was able to print to the edge of the pieces on the top layer of the invite. However, printing on a custom sized paper was a challenge. It took a long time and lots of scrap paper to figure out the perfect printer settings. It was more of a headache than it was worth. I recommend printing your designs on a standard letter size, and then getting them cut to size. If you're willing to invest the time and energy into DIYing your wedding invites, you can save money! Best of luck in your wedding planning!